Xtext has been released as a part of the Eclipse Galileo release train on June 24th, 2009. Xtext is a framework for building DLSs (domain specific languages). In fact, it can be seen as a DSL for defining DSLs. In this article, we will develop a small DSL for defining entities. Hop over to http://xtext.itemis.com and download an Xtext distribution matching your platform. We've got all major platforms: Windows, Mac OSX Carbon, Mac OSX Cocoa 64, Mac OSX Cocoa 32, Linux Gtk 64, Linux Gtk 32. To install, unzip the distribution file to a directory of your liking. Windows users, please make sure you unzip to a directory near to your filesystem root! Eclipse contains files and folders with long names that might be hard to handle for Windows. org.xtext.example.entity - this project contains the DSL itself, including all back end infrastructure like the parser and the meta model. org.xtext.example.entity.generator - this project contains a code generator which will transform the DSL scripts (aka models) you write in your DSL into something useful. In our example, we will create some POJOs and DAOs from our models. Upon finishing creating these three projects, Xtext opens a file Entity.xtext, which contains a sample grammar, which we will change in a second. The star (*) denotes multiplicity. We might also have chosen square brackets (Person employees) or something completely different - it's largely a matter of taste. The first line indicates we want the new grammar to be derived from the (built-in) grammar Terminals, which defines some basic terminal rules (like STRING, ID and so forth). If you're interested, CTRL+Click on the language name to navigate to its definition. The second line defines the name and namespace URI for our own grammar. 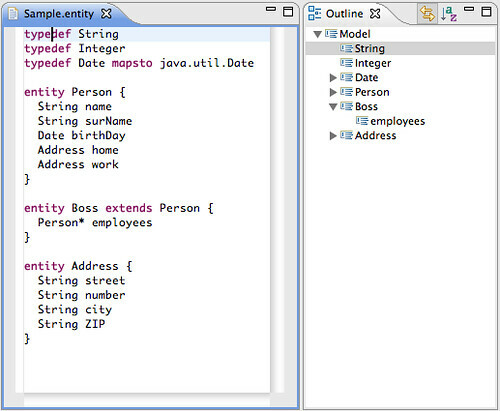 So, a JAVAID is a sequence of IDs and dots, making up a qualified Java type name, such as java.util.Date. As you might have guessed, Entitys start with the keyword entity, followed by an ID as their name. They may optionally extends another entity. Surrounding a rule call with square brackets means "this is a cross reference", i.e. a reference to an already existing element. By now, you should be able to read this rule: an Attribute has a type which is a cross reference to a Type (which is either a TypeDef or an Entity), it has an optional multiplicity indicator (the star) and - of course - if has a name. from this grammar. To make this happen, please select org.xtext.example.entity/src/org/xtext/example/GenerateEntity.mwe and select Run As -> MWE Workflow from the context menu. Xtext will now generate the entire infrastructure for your DSL and after a few seconds you should have a shiny new DSL including a great editor. Seeing is believing, so let's take the DSL editor for a test drive. Select the DSL project org.xtext.example.entity and, from the context menu, select Run As -> Eclipse Application. A second instance of Eclipse will be started. In this new instance, create a new, empty project (File -> New -> Project... -> General -> Project. Create a new file Sample.entity in the new project. Now that we've got a fancy editor for our DSL, we want to transform the models we can create with this editor into something meaningful. This, however, will be the topic of the next installment. Feel free to discuss this article in the comments section of my blog. Should you have any technical questions regarding Xtext, we've got an excellent newsgroup where the committers answer your questions. We also offer professional (commercial) support, i.e. customized trainings to get your team up to speed. Just drop us a note, we're happy to discuss the details with you.